Placed in the south-western Poland, it is one of the most beautiful cities in this country. Many people connect it with numerous islands, bridges and the figurines of… dwarfs. Indeed they are an important element of local landscape. 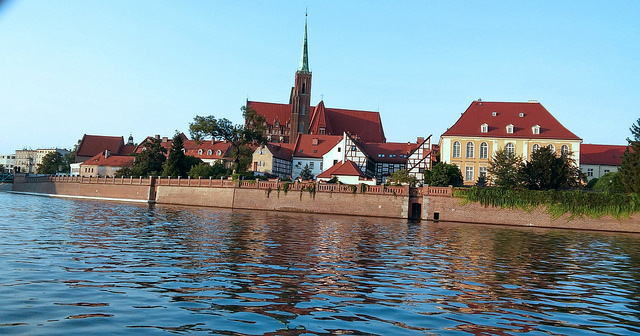 Lying on the banks of the river Oder, Wroclaw is the biggest city in this part of Poland. Tourists from another towns as well as from abroad come here to feel the specific atmosphere of this place. In ancient times there was a small settlement in this location. But the actual history of this city begins in 10th century. There was a borough these times in the a part of the city now called Ostrow Tumski. Later on, the cathedral was built. In the middle ages Wroclaw was one of the most meaningful cities in Poland. The Polish, Czech and other rulers were reigning here over the centuries. In its whole history, the city got through a lot of invasions and wars. During Second World War, almost 70% of the city was destroyed. Nowadays it is enjoyable again – with a large amount of monuments, historical places and modern attractions. The oldest part of Wroclaw, Ostrow Tumski delights with its monumental character. The Gothic cathedral has an observation deck over 90 m above the streets. Here the tourists can admire the breathtaking view on the whole city, with pretty red roofs of old buildings. One of the other obligatory places to see is the town square with wonderful, Gothic city hall (Old Town Hall). Moreover, the square is surrounded by colourful town houses. The monument of Aleksander Fredro – Polish comedy writer is located on the square. Also, the fountain can be found here, bringing a cool breeze in summer. The square is an important point on the cultural map of the city – a lot of events take place here. For people tired of museums and streets Wroclaw offers the visit in local zoo. Opened in 19th century, in 1865, it is the oldest one in Poland and it presents over a thousand of various species, even very rare ones. The new enclosures have been opened in recent years. Another interesting place is Japanese garden, established in the beginning of 20th century. In that park place people can admire the beauty of various exotic plants and rest surrounded by wonderful nature. Some people may also be interested in a cruise on Oder river. In Wroclaw nobody will be bored. Several days can be too little to see all the interesting places here. For sure this city is worth seeing – not only due to magnificent architecture. Dwarfs are waiting! « How we should prepare to vacation planning?